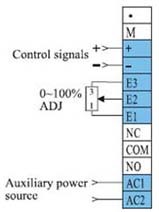 The auxiliary powers (ACI, AC2) are independently controlled for all models. Build-in buffering output adjustment (SFS VR), adjusting range 1~22 seconds. 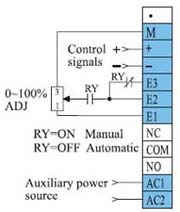 In case of 0.5 Hz sudden power losses, system output can switched off immediately. 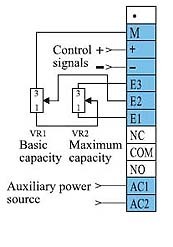 Once the power is restored, the system will buffer the output to prevent the voltage surge for fuse burn-down. 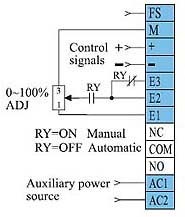 In cases of SCR overheating or fuse burn –down, the system output is stopped immediately. 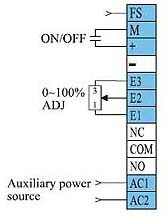 Once the malfunction is eliminated and power is restored, the system will buffer the output to prevent the fuse burn-down. 4~20mA, 1~5VDC, 2~10VDC, 0~20mA, 0~5 VDC, 0~10 VDC, Dry contact points, etc. 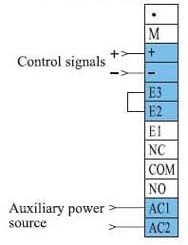 and all control signals are ready to use. When the power regulator is operating, the heat will be generated automatically. Please install the system vertically and leave some empty space on two sides to aviod the temperature inside the regulator rising continuously. There must be some ventilation holes on the control box. Please follow the principle of hard air rising to intall the ventilation holes or estra cooling fans. Please avoid installing the regulator in the place with high temperature or poor ventilation. 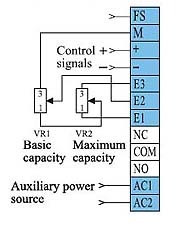 Otherwise, the maximum operating capacity must be set lower than 70% of the nominal capacity. Avoid installing the regulator in the places with heavy water evaporation, acid, alkaline, or corrosive air. The above numbers are based on the conditions of no erosion, no greasy dirt, and no cover on the heat sink and following the recommended installation guides based on the principle of heat transfer. continuous phase angle control, steady output, current gauge reading remains steady. But, every half wave will produce harmonic wave. fixed resistance loading, variable resistance loading, inductive loading, IR light bulb. 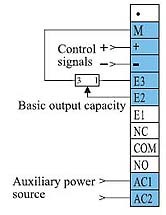 distributed zero crossing control, minimum resolution 1 Hz, no harmonic wave, and current gauge reading oscillates. can cut off power to prevenr personnel from electric shock during maintenance. can cut off supplied loading power when the power regulator malfunctions or the tenperature is higher than pre-set value. Cutting off the power can avoid the system burn down by overheating and prevent more serious damage. 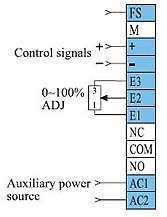 Standard main circuit setup: main power→molded case circuit breaker→contactors→power regulator→loading. The screw must be tightened during the wiring setup to avoid high temperature resulting from bad contact. Once the wiring setup is completed the front panel and safety cover must be properly installed before the system is powered up to avoid the electric shock or shot circuit caused by dropped conductive objects. 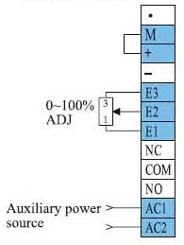 Power light On: Auxiliary power on. 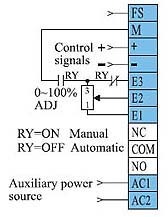 the power regulator for maintenances. Input light On: Control input signal is in. is input, check the connection and the wiring. see if any one of them is set to zero. 3. If the input light L2 is off. (No input signal.) 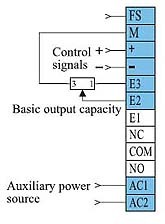 please refer to IN (L2). 4. If the input light L2 is on. (control board malfunction. )→please replace the same spec. 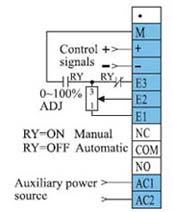 control board or send power regulator for maintenances. damage, or if the fan is stuck by any power object and get rid off it if necessary. place or improve the ventilation. 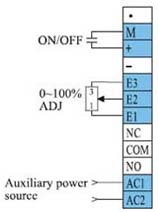 Off: Normal, power regulator is not overheating. shortage and the ground of the loading before restoring the power.